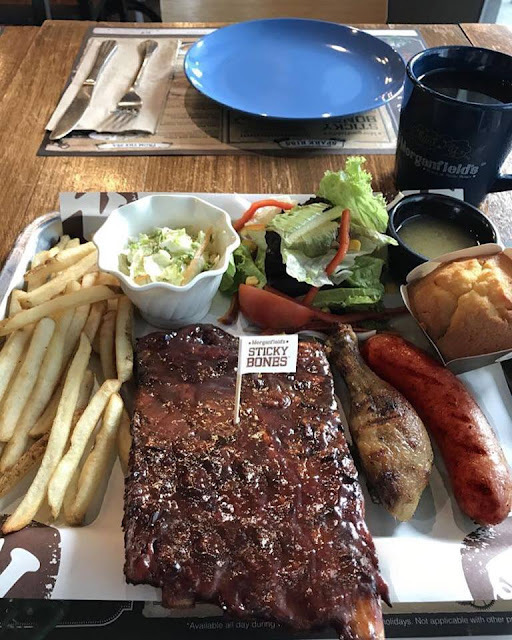 Check out Morganfield's SM MOA All You Can Eat Promo! Available until October 15, 2017 during weekdays from 11am-2pm & 6pm-9pm. A feast for only P695 per person! First order will consist of 4-bone Savory Sweet Spare Ribs, 1/8 chicken & sausages, and choice of sides. It comes with ice cream & bottomless drinks too. This great deal is available exclusively at Morganfield's SM MOA branch. No sharing and leftovers. P995 will be charged for leftovers. Available at Morganfields SM MOA only. Promo runs from September 11 to October 15, 2017. Customer selects the preferred side item/s to go with the first serving. Additional requests from the selected menu list will be made on a per order basis. Sharing the table with Non-All-You-Can-Eat diners is not allowed. Not applicable with other promos and discounts. Promo price of P695 is inclusive of VAT but exclusive of service charge (so, a service charge will still be added to the price). Senior citizens can avail of this promo OR the Senior discount provided under the Expanded Senior Citizens Act of 2010, whichever is higher. For more info, please call Morganfield's SM MOA at (632) 978-2460 / 0917-6529706.